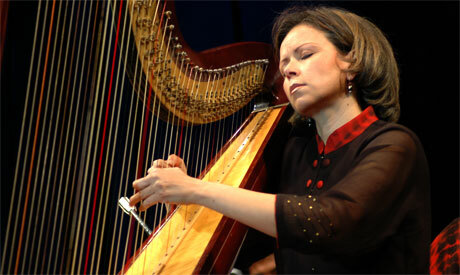 Harpist Manal Mohei Eldin is a well known and accomplished Egyptian musician. As a soloist she has a countless number of recitals to her name, along with performances with many orchestras in Egypt: the Cairo Symphony Orchestra, the Cairo Opera Orchestra, the Cairo Festival Orchestra, etc. She participates regularly in many music festivals — Citadel Festival for Music and Singing, Opera House Summer Festival, etc. — and takes part in numerous cultural events in Egypt, including concerts at well-known tourist sites, as well as outside the country. Her recitals and concerts are often broadcast on the Egyptian radio and television. She also made several recordings of film music. Currently, Mohei Eldin is a professor at the Cairo Conservatory; she continues to perform in Omar Khairat’s ensemble and with her own Oriental ensemble. Over the past decade, she became well known at a popular level through her many performances with the Banat Al-Nil (Daughters of the Nile) ensemble, which she co-founded in the early 2000s and then with her own Manal Mohei Eldin Oriental ensemble. With her ensemble she released a CD including an Arabic repertoire for harp. Most recently, Mohei Eldin became actively involved in the political side of culture; she joined the artists’ opposition towards former president Mohamed Morsi and stood against Morsi’s minister of culture Alaa Abdel-Aziz — in office 7 May to 3 July 2013 — who, according to the artists and intellectuals, aimed at destroying Egypt’s cultural identity. Joining the sit-in held inside the ministry headquarters on almost daily bases, Mohei Eldin also participated in the artistic activities organised on the street. In August 2013, she was given the State Incentive Award for Arts, a prestigious recognition by the Egyptian state for outstanding achievements. Though Mohei Eldin’s nomination for the Incentive Award dates back to 2011, it seems this is the perfect timing for receiving it. Mohei Eldin’s family is deeply rooted in arts and culture. Her father Mohei Eldin Hussein is a visual artist; he also plays oud and sings hobbyistically in private gatherings. “Our father was very happy to see his children enter the Cairo Conservatory and take music professionally,” Mohei Eldin explains, referring to her studies, which she began at the age of 10 with professor Nahed Zikri. Her brother Sherif Mohei Eldin is an accomplished composer and conductor. Manal Mohei Eldin graduated with honours in 1987, and performed several times at the Gomhouriya Theatre, which after the burning down of the Old Opera House in 1971 served as foster home for the arts. At the end of the 1980s, after the opening of the New Opera House in 1988, Mohei Eldin received a scholarship from DAAD (the German Academic Exchange Service) and left to Germany to continue her studies at the Hochschule der Musik and Darstellende Kunst in Frankfurt, and at the Hoch Institute der Musik in Wurzburg. In parallel, she joined several ensembles and introduced new formations to the Egyptian audiences, such as four harps on stage. “During my education and work at the Opera, I performed mainly the Western repertoire. In parallel, however, I always wanted to explore other genres. I used my harp to perform many arrangements, jazz, Oriental melodies, etc.” What makes Mohei Eldin unique is her ability to invest in many genres with the same dedication. No doubt her experimentation with the Banat Al-Nil and then her own Oriental ensemble helped her to develop a connection with a wide audience that would not choose to attend Western classical music. Undeniably, today, to many such music lovers, the harp is associated with Mohei Eldin and her ensemble. Through her work with the ensemble — which consists of harp, a string quintet, nai, accordion, and Oriental percussions — Mohei Eldin proved that there are no limits to her imagination and choice of music. In her concerts, she usually includes a large number of compositions arranged for harp based on well-known compositions from Mohamed Abdel-Wahab, Fayrouz, Asmahan, Omar Khairat, Sayed Darwish, etc. She also invites the listeners to lesser known works, unveiling new musical territories. At times Mohei Eldin includes new contemporary music by Egyptian composers, such as a composition that she describes as “close to her heart”, composed by Mohamed Saad Basha and titled Amina (the name of Mohei Eldin’s own daughter). It is evident that during the whole past decade, Mohei Eldin’s skills paralleled by an intelligent approach to the audience brought her huge success; her concerts are usually a full house with people of all social strata and musical preferences. “The opera gives an elitist impression — but it can still reach a much wider audience. 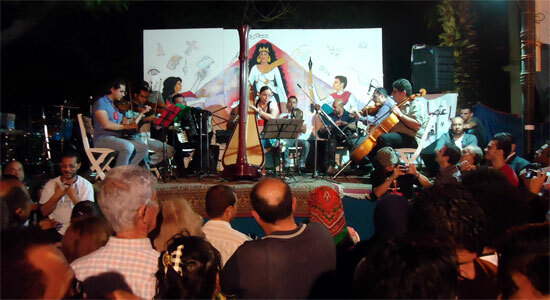 Classical music demands huge effort and is not always rewarded with a large audience inside the opera halls… On the other hand, the Egyptian musicians are left to exert their own efforts in marketing their events. I am lucky that my husband, who is not a musician, became my artistic manager. I have the luxury of concentrating on practice and performance. At the same time, Oriental music carries a different scent and has its own audience.” Mohei Eldin says. When the 7 May 2013 cabinet reshuffle took place and Abdel-Aziz became the new minister of culture, responding to the strong opposition from the culture field with a series of firings of key culture figures, Mohei Eldin took part in weeks-long protests inside the ministry and the sit-in: “The sit-in was an important statement from the artists and intellectuals, paralleled with a beautiful festive atmosphere, street performances, etc.. It was an important factor adding to a general build-up to the nation-wide demonstrations of 30 June,” which eventually led to the removal of Morsi. While she fondly recalls those moments, Mohei Eldin points to the many new discoveries and lessons learned. “During the weeks when we all opposed the Muslim Brotherhood, many people did not mind cooperating with them, jumping on the opportunities given to them by the then-authorities. All they wanted was to gain a chair or add a point to their otherwise not very significant CVs. We have to be very cautious as even though many such individuals lost their power after Morsi and his cabinet’s removal, they are still among us,” she points to those who are ready to make a deal with any devil for their own personal benefits.